In the Special Ed Tech article, “Using tablets in moderate/severe special education classrooms,” Carmen Watts-Clayton discusses tablet use in the moderate/severe special ed classroom, and encourages exploration of the arts and music. So this month I’m going to compare six iPad music apps, available on iTunes, which can be used by moderate/several special ed students and the very young. All of these apps are rated for ages 3 and up. 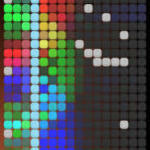 Beatwave plays loops of sounds and pitches defined by the user on a grid of time (x) versus pitch (y). The loops are quite short (about three seconds by default, or 16 8th notes) so it’s hard to play anything approaching a melody. But it does show the playout of rhythm and pitch. The result often sounds like a repetitive techno loop. 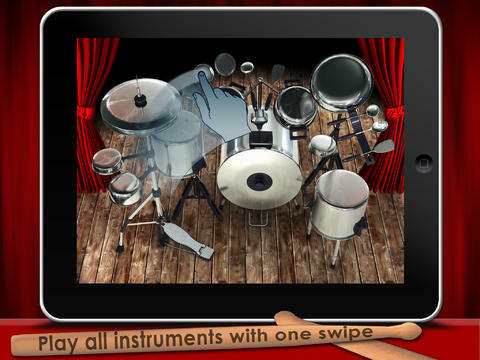 Pantastic allows the user to re-create the banging of pots and pans as a drum set. While innovative, this can also be annoying…another reviewer said she chose to leave the room when her child played because it was so noisy! Unfortunately, this app also came with intrusive advertising. 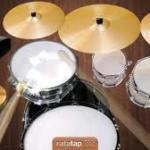 Similar to Pantastic, Ratatap Drums provides a virtual drumset. 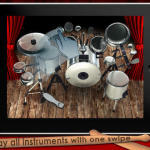 Unlike Pantastic, the sounds are drums and this app is highly rated for being realistic and engaging. I encountered volume problems with both this app and Pantastic, though not with any other music app. 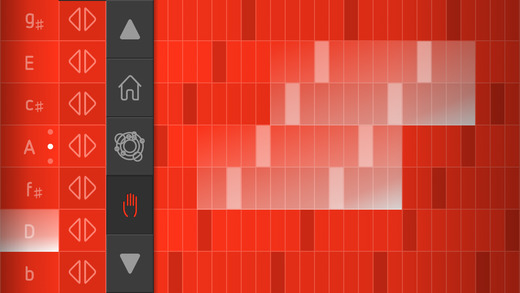 Sound Prism lets the user play a wide variety of chords simply by touching the screen. Since it plays only harmonies, it’s nearly impossible to play anything dissonant, so even when used randomly it’s pleasant to listen to. 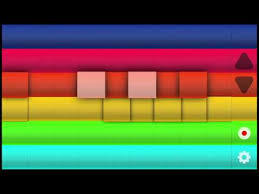 It’s hard to create a melody though, and it doesn’t visually depict rhythm. The app does have an option to display key names to indicate how the chords are constructed. 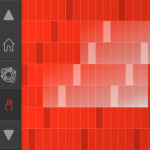 Like Sound Prism, Fingertip Maestro allows the user to play chords, but it provides a greater selection and variation of chords than Sound Prism. 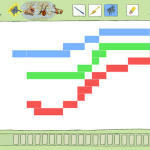 It’s gorgeous to look at and easy to create beautiful sounds, so if your student just wants to randomly touch the screen, this will deliver a satisfying result. 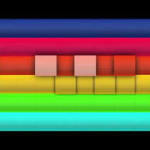 However, the notes aren’t organized in an obvious pattern, so it won’t teach about note arrangement or rhythm. There’s a reason this app costs something, and that’s because educationally Morton Subotnick’s Pitch Painter is far superior to the other apps mentioned in this article. Like Beatwave, it is a grid of a short amount of time (x) versus pitch (y) with looping available. 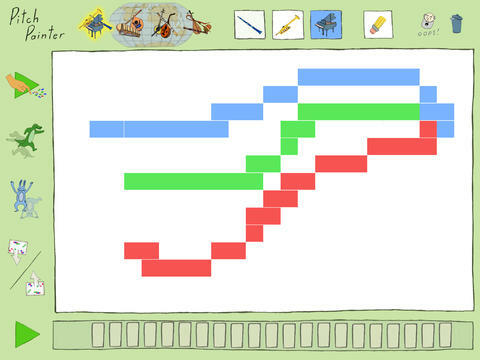 But the user interface is much better in Pitch Painter. 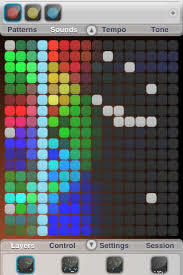 The grid is the user’s fingerpainting, where instruments are identified by color; for example, piano is red and horns are green. 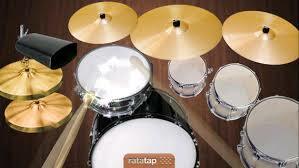 There are instrument sets from Europe/North America, West Africa, MIddle East, and East Asia. The user can choose to reverse the tune or play it upside down. Given the freedom to select any note in the scale, your student might not make beautiful music with this app. But he or she will certainly see the playout of rhythm, pitch, and instrument. Do you know of good learning games you would like to tell others about? Write to our editor at SpecialEdTechEditor@gmail.com. Tagged games for learning, iPad apps, music, PlayWorthy. Bookmark the permalink.